There’s a new browser in town for iPhone, iPod touch, and iPad users. 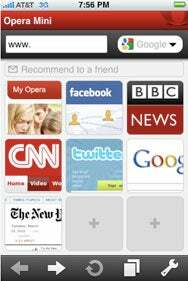 Opera Software announced Monday that Apple approved an iPhone version of its Opera mini mobile browser. By Monday evening, the free browser was available for download from the App Store. Back in February, Opera announced that it was completing work on a version of its browser for the iPhone and that it planned to submit it to Apple for approval and distribution. The move was widely seen as risky, since Apple has, in the past, been dodgy on the subject of whether browsers that aren’t built on Mobile Safari’s underlying technology would be allowed on its iPhone OS platform. Opera’s announcement that it has submitted the browser to Apple for approval on March 23 was, unsurprisingly, met with a fair amount of skepticism; in a bit of App Store mockery, the company even set up a web page to keep track of the amount of time during which the app had been in the approval process. The final tally: a little less than three weeks.